The Merimbula Star-hair (Astrotricha sp. Wallagaraugh) is an endangered species with a very restricted distribution. And Tura Beach is the hot spot! 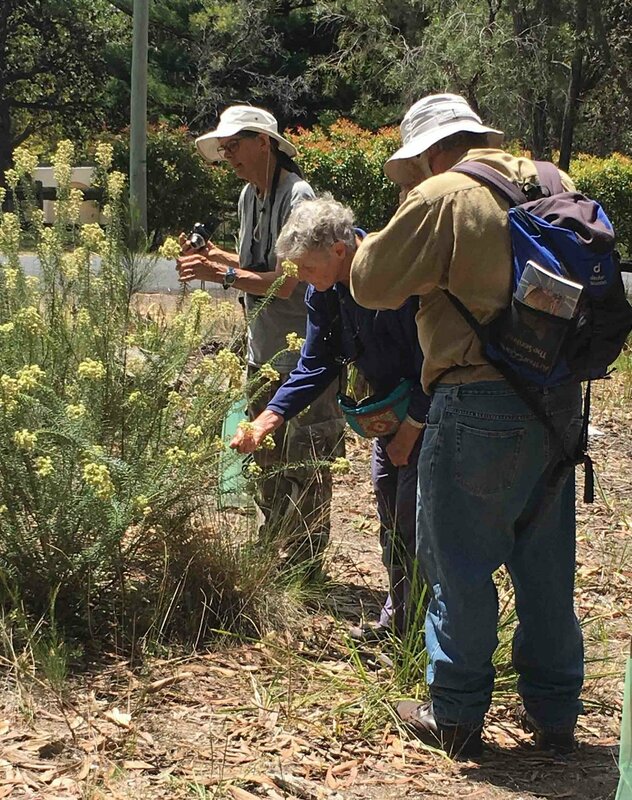 On 24th November, members of the local community joined forces with visiting scientists and national parks staff to collect valuable information on the biology of this special plant. This is yet another example of the importance of volunteers in natural history research. The survey has provided new information about this threatened species, information of value to those entrusted with securing the plant’s future. 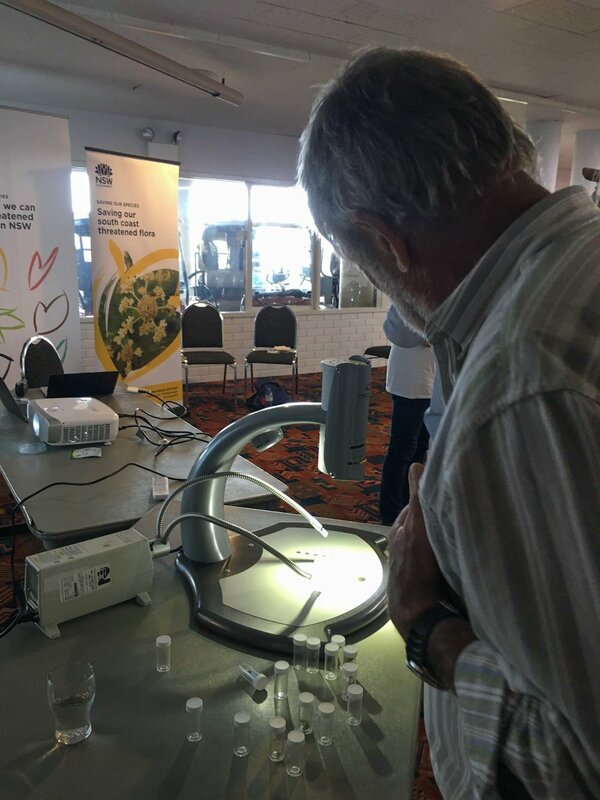 The Office of Environment & Heritage (Threatened Species Unit / Saving our Species) coordinated the event, with support from the Atlas of Life and Bega Valley Shire Council. The Merimbula Star-hair (Astrotricha sp. Wallagaraugh) is an endangered shrub that is known from only two populations in NSW. One of these populations occurs at Tura Beach on the south coast of NSW. The other two populations grow on the banks of the Wallagaraugh River, one in Yambulla State Forest south of Eden, the other near Gypsy Point in Victoria. The Tura Beach population is by far the largest and is therefore considered the stronghold for the species. In summer, the Merimbula Star-hair puts on an impressive display of creamy–white flowers. Local volunteers spend two hours photographing all the floral visitors they could find, at three separate sites around Tura Beach. Determining the nature of plant–pollinator relationships is an important step in the protection of threatened plants. 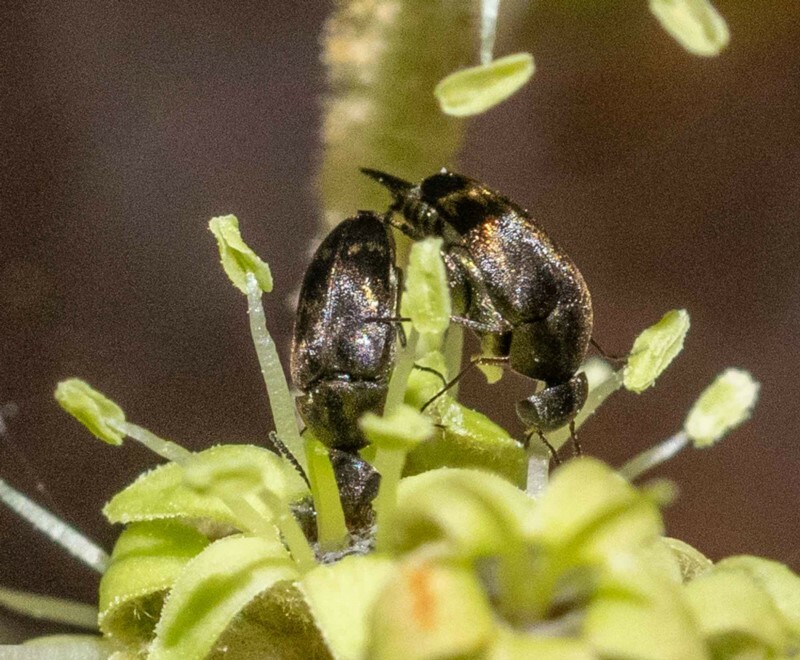 Specialist plant–pollinator relationships can contribute to the decline in threatened plant populations. The loss of a specific pollinator species may not be a problem for plants that can use a wide range of pollinators for their reproduction (‘generalists’ plants). However, pollination limitation (i.e. inadequate pollination) can occur in ‘specialist’ plants that are entirely dependent on one pollinating species. Loss of a such a pollinator species will lead to a sharp decline in the specialist plant’s sexual reproduction and seed production. Little is known about which pollinators visit the Merimbula Star-hair. The survey was designed to help fill this information gap. The event was timed for a period of peak flowering, and sought to identify the range of insects visiting the flowers. 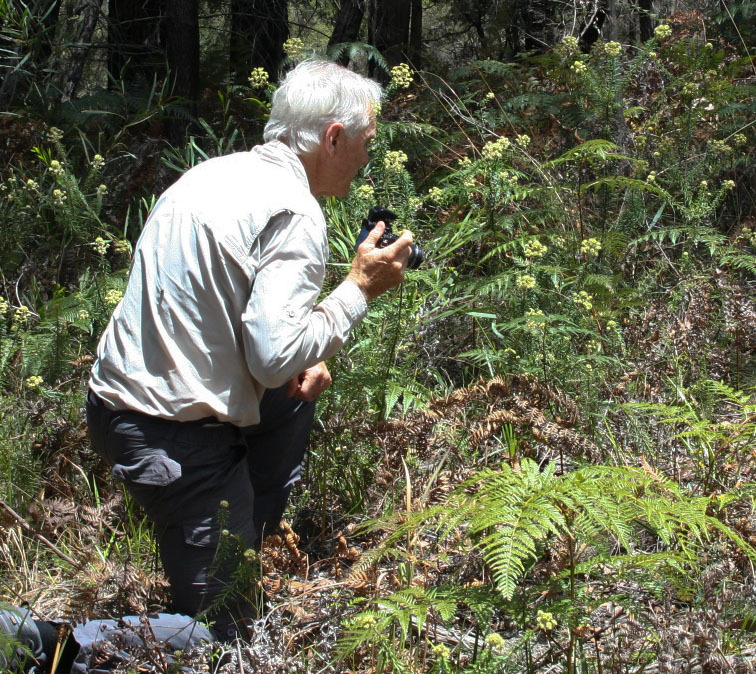 Leading the survey was Dr Roger Farrow, a scientist with a deep knowledge of the behaviour and ecology of insects in south-eastern Australia. Before we set off to explore the plants, Roger described some of the features that determine whether or not an insect is likely to be an effective pollinator. is the insect actually in contact with the parts of the flower bearing pollen? does the pollen adhere to the insect? Hairy is good, smooth is less so. is the insect likely to travel from plant to plant? is the Merimbula Star-hair flower attractive to insects? We sought to record the diversity of insect visitors to the flowers. The best way to do this was to simply watch the flowers and photograph all the insects we saw. With around twenty participants, we were able to split into groups and simultaneously survey three different sites around Tura Beach. In addition to photographing insects, one group also collected a few specimens for closer examination. Most of these insects were subsequently released. This data was later uploaded on to the Atlas of Life in the Coastal Wilderness NatureMapr database, and insects were identified by a number of experts including Dr Roger Farrow. The survey data provides evidence for the Merimbula Star-hair using a generalist pollination strategy. The flowers support a wide range of floral visitors and so the plant is unlikely to be affected to any sudden decline in the number of any single pollinator insect. This is good news for the plant. Furthermore, the plant appears to play an important role in the lifecycle of many insect species. 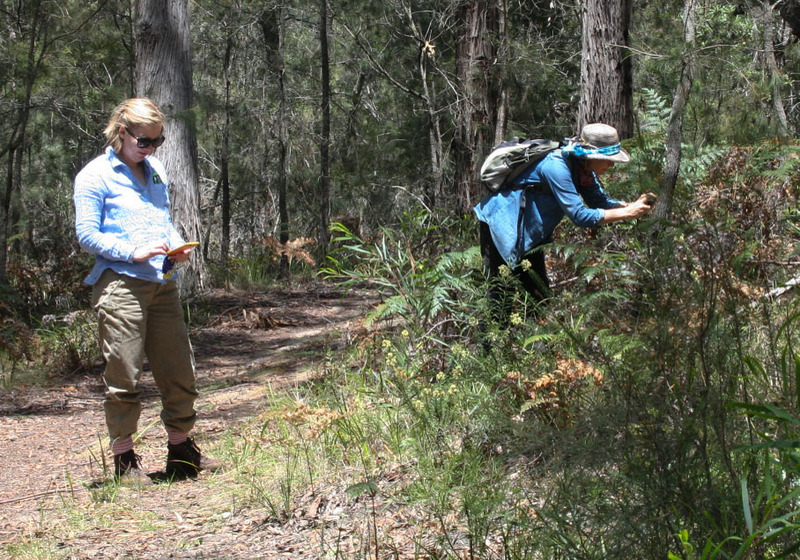 We observed few other plants in flower in the survey areas, suggesting that the Merimbula Star-hair flowers were providing an important source of pollen and nectar to support the local insect fauna. The Kunzea and Leptospermum that were flowering in the vicinity of the Astrotricha were hosting some of the same insect visitors. The flowers also provide habitat structure. We sighted many insects simply perching on the plants, and many of these were hunting or breeding. Below are just some of the insects recorded on the day. Dr Roger Farrow is currently preparing a paper, analysing the findings in detail. When available, we will share this paper here on the Atlas of Life website. And, of course, all the individual insect sightings are now a permanent part of the Atlas of Life NatureMapr database. This link lists all sightings for Tura Beach … including the 130+ insect records on the day of the survey. Do you want to read more about the ecology of insects in our region? Look out for this CSIRO publication by Roger Farrow.